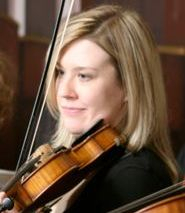 Maggie Davis graduated with a BA in violin from Butler in 2001. Since then she has been teaching private violin, voice, and viola lessons to students of all ages. She attended Mark O’Connor’s fiddle camp in 2005 and has since been active playing Celtic fiddle and alternative folk styles. She’s played fiddle and lead vocals in the traditional Irish band Ennis Clare, and with the folk band, Iron Curtain Breakdown. Currently she performs with the touring Celtic rock band, Mother Grove.